Algae is much more than that pesky goo in your fish tank – researchers at the Rochester Institute of Technology are now using algae grown at wastewater treatment plants to synthesize biodiesel. Wastewater treatment plants regularly utilize algae to remove ammonia, nitrates and phosphates from wastewater before dumping into receiving water – using the tiny plants as a source of fuel is a brilliant way to get extra mileage out of the system. Biodiesel made from algae could replace 50 percent of the diesel fuel that the plant currently uses to power its equipment. 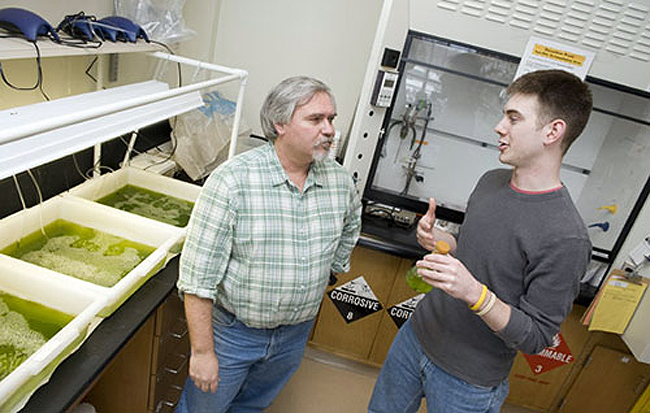 Researcher Eric Lannen has worked with chemistry students Emily Young and Jeff Lodge to isolate lipids from the algae and extract them to make biodiesel. 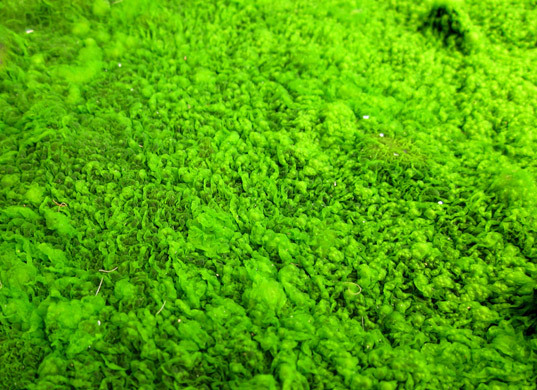 Their algae of choice is the single cell Scenedesmus, which they grow at a plant in Irondequoit, New York with the company Environmental Energy Technologies. The wastewater plant grows new batches of algae about once a week — a notably faster production rate than corn or soybeans. It is also more efficient to produce, as it only requires photosynthesis to thrive, rather than farm land and labor. The use of algae in wastewater plants is a win-win situation, since the reaction of purifying water yields the lipids required to produce biodiesel. Could algae be the fuel of the future? Environmental Energy Technologies hopes so – they have already increased algae production from 30 gallons to 100 gallons and hope to expand to 1,000 gallons by spring. hi, just wanna ask what are the problems that you are encountering in using algae for treating water? thank you. hope you will reply. Algae is much more than that pesky goo in your fish tank - researchers at the Rochester Institute of Technology are now using algae grown at wastewater treatment plants to synthesize biodiesel. Wastewater treatment plants regularly utilize algae to remove ammonia, nitrates and phosphates from wastewater before dumping into receiving water - using the tiny plants as a source of fuel is a brilliant way to get extra mileage out of the system.